Connecticut Senate candidate Richard Blumenthal surrounded himself with war veterans today while denying that he intentionally misrepresented his military record to voters. Connecticut Senate candidate Richard Blumenthal surrounded himself with war veterans today while denying that he lied about his military record when he actually received deferments and served in the Marine Reserve. "Now, on a few occasions I have misspoken about my service, and I regret that and I take full responsibility," he said at a news conference at a Veterans of Foreign Wars post in West Hartford. "But I will not allow anyone to take a few misplaced words and impugn my record of service to our country." Blumenthal spoke one day after a published report revealed that the Democratic senatorial candidate never served in Vietnam despite repeated public claims to the contrary. The bombshell dropped as Blumenthal, Connecticut's attorney general, seeks the seat being vacated by Democratic Sen. Christopher Dodd. Blumenthal arrived at his news conference to cheers from about 20 veterans, including Marines in red windbreakers, gathered in a show of support. He gave the thumbs-up sign as he approached the podium. "This is nothing but dirty, cheap politics," Pasquale Battinelli, 77, an ex-marine who served during the Korean War, said moments before the new conference. "It's not fair what's being said about him. He never said he served in Vietnam. It's not fair given everything he's done for veterans." In his new conference, Blumenthal repeatedly used the phrase "a few misplaced words" to defend himself against charges that he misled voters about his service in Vietnam. He said he enlisted in the Reserve after finding a listing in the phone book. He said he got into the Marine Corps Reserve with "no special help, no special privileges." He said he turned to the Marines because of long waiting lists for the other branches of the military. 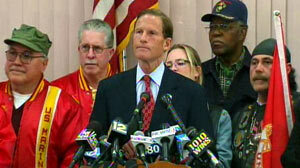 The Marine recruiter, he said, offered to put Blumenthal on a bus to basic training right away. Supporters defended his record on veteran affairs. "He has always been completely straightforward" about his military service, said Jean Risley, a chairwoman of the Connecticut Vietnam Veterans Memorial Inc. "I never once heard him say that he was in Vietnam." Risley was quoted in the Times as recalling an emotional Blumenthal describe the abuse that he and other veterans received when they returned from the war. She told ABCNews.com today that she was misquoted. Blumenthal received five deferments between 1965 and 1970 and ultimately served stateside for six years in the Marine Corps Reserve, according to the New York Times. He was assigned to a unit that focused on fixing playgrounds and organizing Toys for Tots drives. By avoiding the war, he was able to attend Harvard University, pursue graduate studies in England, serve as a special assistant to the Washington Post's publisher and work in the Nixon administration. The Times report said Blumenthal, 64, addressed veterans' groups over the years without saying that his service never took him out of the United States. In 2008, speaking before a group in Shelton, Conn., he implied that he was among veterans who felt isolated and unwelcome when he returned from the war. "I served during the Vietnam War," he said. "I remember the taunts, the insults, sometimes even the physical abuse." Blumenthal is hardly the first public official to be accused of embellishing or distorting a military record. In 1996, a grand jury in Oregon indicted freshman Rep. Wes Cooley on charges he lied about his military service in official state voter guides. Cooley dropped his bid for a second House term after questions were raised about his claim that he had served in the Army Special Forces in Korea and whether he concealed his marriage so his wife could collect benefits as the widow of a Marine. Rep. Tom Harkin, D-Iowa, had to clarify his statements for once suggesting that he had flown combat missions over North Vietnam, which he had not done. In 1999, Donald R. Nicholson, the police chief of Amelia, Missouri, in the 1980s, admitted that he had lied about being a Vietnam veteran and a prisoner of war to obtain better veterans benefits. Thomas Beebe, head of military programs at Southern Illinois University, and Raymond Aucker, a schools superintendent in Lansford, Pa., claimed to be Navy SEALs. They were exposed in the 1990s. Adm. Jeremy "Mike" Boorda, chief of naval operations, killed himself in 1996 after revelations that he wore Vietnam combat decorations he did not earn. Richard Kohn, a professor of military history at the University of North Carolina at Chapel Hill, said that the Vietnam War had spawned many people who lied about their service records. "There is a very, very widespread tendency in society to fake Vietnam service," Kohn said. "It happens a lot. … I don't know why. I'm not a psychiatrist. "You could tote it up to a half dozen things: they don't think they can get caught; it becomes fuzzy in their own mind; the wish becomes the parent of the fact; they get carried away because so many politicians speak off the cuff. A lot of politicians draw their energy and perhaps some of the chemistry from their audiences and they begin to tell them what they want to hear." Blumenthal's campaign called the report in the Times an "outrageous distortion" of his record. A short video posted on the campaign's Facebook page shows the candidate saying during a debate in March that "although I did not serve in Vietnam, I have seen firsthand the effects of military action." Rob Simmons, the GOP candidate for the seat, said in statement today, "As someone who served in Vietnam, I respect Richard Blumenthal for wearing the uniform. However, I am deeply troubled by allegations that he has misrepresented his service. "Too many have sacrificed too much to have their valor stolen in this way." Meanwhile, Blumenthal held a 61- 28 percent lead over businesswoman Linda McMahon, and 62-26 percent vs. Simmons, in a Quinnipiac poll March 15, the most recent airworthy polling in that contest. Blumenthal had a 79-13 percent job approval rating, "continuing a 10-month string of approval ratings of 78 points or higher," and personal favorability of 70 percent. In intraparty matchups, Blumenthal led Merrick Alpert by 81-6 percent; on the GOP side, McMahon vs. Simmons was 44-34 percent. ABC News' Russell Goldman and Gary Langer contributed to this report.